At the time of the last census (2015) there were approximately 880 mountain gorillas living in the mountain ranges of Rwanda, Uganda and the DRC (Democratic Republic of Congo). Pioneer zoologist Dian Fossey and naturalist-broadcaster Sir David Attenborough first brought the plight of the great apes to the world’s attention in the 1980s when the world’s mountain gorilla population had plummeted to just a few hundred individuals, perilously close to extinction. Thanks to the efforts of international conservation organisations and the protection of regional national parks their number has gradually increased. A new census is currently underway, and hopes are high that the population will approach 1,000 individuals. But the species is still designated as critically endangered and its fate continues to hang in the balance. While poaching for the exotic pet trade has been almost eradicated and human activity in the forest has been curtailed, their fragile ecosystem remains threatened by human encroachment, climate change and war. The battle for survival continues. In this context, tourism may be the saviour of the mountain gorilla. These beguiling creatures have put their home countries on the world tourism map, creating a valuable premium for their conservation and the protection of their habitat. Despite considerable hurdles, the conservation through tourism model has been largely successful and revenues from the sale of gorilla tracking permits has made a huge impact on their long-term outlook. 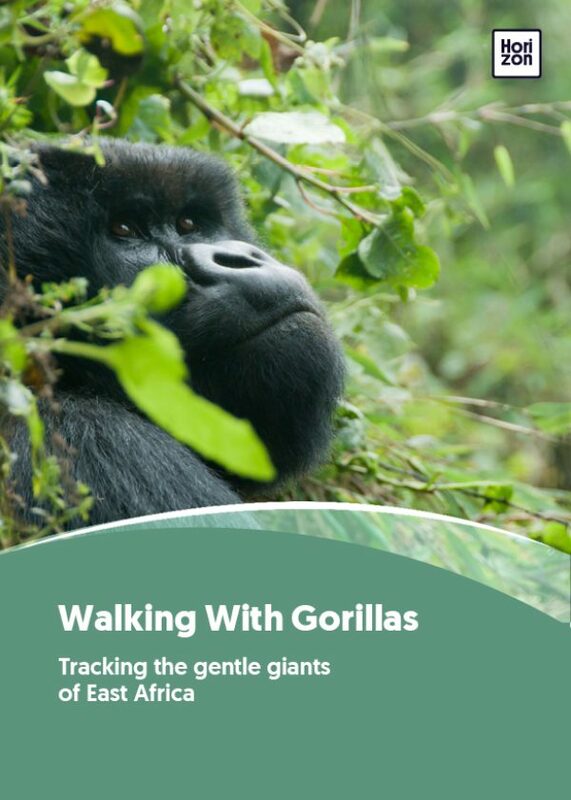 Gorilla tracking has become the number one tourism activity in both Rwanda and Uganda and the industry is highly developed and professionally organised. In choosing to visit the mountain gorillas you can contribute directly to the species’ survival, provided that you’re a responsible traveller and play by the rules (see Regulations). There is a good range of accommodation to suit most budgets and the ranger guides are friendly, well trained and brimming with information. They know the gorilla families intimately and are passionate about their protection. Most gorilla tourism goes to Rwanda and Uganda, two politically stable countries with excellent tourist infrastructure. The eastern DRC is now stable enough for public gorilla tracking, but options are more limited and demand remains low. The hope is that tourism and conservation in Rwanda and Uganda offers a positive example that can influence stability and therefore economic development in the DRC. Mountain gorillas share an incredible 98% of their genetic material with humans. They live up to 50 years, and the oldest known living mountain gorilla is Guhonda who is over 40 years old. As male gorillas mature the hair on their backs turns silver, giving them the name silverback. In contrast, a young male gorilla is known as a blackback. A male mountain gorilla may weigh between 160 and 230 kg and reach a standing height of nearly two metres. Mountain gorillas use a range of sounds to communicate and researchers have documented as many as 25 different sounds, including grunts, roars and shouts. They are entirely vegetarian and consume up to 35 kg of food per day -- flowers, bamboo, fruit, leaves, shoots and roots. Although they may be ten times more powerful than the strongest human, mountain gorillas are known for their gentleness. Even so, this naturally peaceful creature should be treated with the utmost respect for if a gorilla feels threatened s/he may lash out. Sick gorillas and females nursing infants may feel particularly vulnerable. Visitors who get too close to the gorillas or who scare them with loud noises or flashing cameras may be surprised by the occasional charging, or even a slap! Mountain gorillas do not survive in captivity and most gorillas seen in zoos are the lowland gorilla of West Africa. To meet our mountain-dwelling relatives in the flesh means travelling to visit them in their home. You won’t regret it. The majority of the mountain gorilla population can be found in just a handful of locations: Uganda’s Bwindi Impenetrable National Park and Mgahinga Gorilla National Park, and Rwanda’s Volcanoes National Park. Uganda has the largest mountain gorilla population, with around 400 gorillas living in two national parks in the country’s south west: Bwindi Impenetrable Forest and Mgahinga Gorilla National Park. Bwindi Impenetrable Forest is a whopping 331 km² and supports almost half the world’s population of mountain gorillas. It is one of Africa’s richest rainforests, and is a UNESCO World Heritage site. Bwindi is over 25,000 years old and ranges in altitude from 1,160m to 2,607m above sea level. The forest’s age and altitude give Bwindi an abundant biodiversity. More than 320 tree species have been recorded here, which are home to 310 butterfly, 88 moth, 51 reptile and 120 mammal species, including a further nine primates, such as chimpanzees, olive baboons, black and white colobus monkeys, grey-cheeked mangabey and blue, red-tailed and L'Hoest monkeys. In comparison to Bwindi, Mgahinga Gorilla National Park is a relatively puny 33.7 km² and is Uganda's smallest national park. But Mgahinga is just one part of a larger Virunga conservation area which covers 434 km² of volcanic mountains linking Rwanda, Uganda and the DRC. The forests of Mgahinga are less dense than in Bwindi, but the climb to see the gorillas can be steep. Mgahinga has arguably the best views of any of East Africa's gorilla tracking locations, since just a few minutes inside the park gate, you can look down over the valley floor across to Lake Mutanda and into the DRC. The drive to Mgahinga has a dramatic backdrop of three volcanoes that guide you towards the park entrance. The foothills are gently sloping wide-open spaces and here -- unlike elsewhere in Uganda -- the earth is almost black. Gahinga rocks, a type of volcanic debris, litter the fields. Volcanoes National Park (VNP) -- formerly known as Le Parc National des Volcans before Rwanda swapped French for English as its official language -- is home to Rwanda’s mountain gorillas. VNP occupies 160 km² and is situated in northwestern Rwanda where it borders the DRC’s Virunga National Park and Uganda’s Mgahinga Gorilla National Park. Together, these three parks form the Virunga conservation area. Volcanoes National Park is distinguished by five of the eight volcanoes of the Virunga Mountains that sit along the park boundary: Karisimbi, Bisoke, Gahinga, Sabyinyo and Muhabura. The park is bordered by farmland, with the local community cultivating land right up to its boundaries. Gorilla tracking in Rwanda is quite different from gorilla tracking in the dense jungle of Uganda’s Bwindi Impenetrable Forest. Whereas gorilla tracking in Bwindi takes you straight into the dense, dark forest, in Rwanda the trek starts with a gentle ascent for thirty minutes through open farmland with breathtaking views (on clear days) of the Virunga volcanoes. Here the forest is predominantly bamboo, which means less canopy to block the daylight. The bamboo canes sway several metres overhead, cracking and groaning under the weight of the gorillas shifting around in search of tender shoots. Elsewhere, the gorillas may be found out in the open, lazily munching vegetation. Gorilla families vary in size from fewer than 10 members to 65, with bigger families usually splitting into smaller groups. Mountain gorillas are social animals. A family typically consists of one silverback, several adult females and their offspring, but it’s also common for families to include closely related adult males. When a family leader dies, a subordinate either takes over or the remaining individuals join another family. There are more females than males in a gorilla family so a small number of male loners roam the forests by themselves, occasionally banding together into all-male groups. Female mountain gorillas start giving birth at around 10 years old and give birth once every four years or so. Roughly a quarter of their offspring die in their first year. If a mother and baby move to a different family, it’s common for the baby to be killed by the new silverback. Just like humans, every gorilla has a unique character and each family has their own traits and personalities. The ranger guides know each individual and are happy to share tales about their characters, interactions and squabbles. In the dense rainforest, sound is a more useful method of communication than sight. Baby gorillas vocalise through crying, whimpering and screaming. Adults, particularly males, communicate through grunts, barks, cries and chest drumming. Facial expressions are also incredibly important. Uganda has 15 habituated gorilla families that can be visited by tourists: fourteen in Bwindi Impenetrable Forest National Park and one in Mgahinga Gorilla National Park. The Mubare, Habinyanja and Rushegura families can be tracked from Buhoma in the northern sector of Bwindi Impenetrable Forest. If you’ve seen videos of human encounters with gorillas in the grounds of a lodge, it was most likely in Buhoma. Buhoma is a popular place for visitors to stay as it has a good range of accommodation and fantastic views of the rainforest. Tracking here is generally easier than it can be from Rushaga or Nkuringo to the south of the forest. Buhoma is also a good base for visits to local communities and exploring the forest on day hikes. The Nshongi, Kahungje, Mishaya, Busingye and Bweza families live in Rushaga, southern Bwindi and the Oruzogo and Bitukura families live in the Ruhija sector of southern Bwindi. There are fewer lodging options in Rushaga and Ruhija so the early morning drive (through splendid scenery) to the start of the tracking can be longer. The Nkuringo and Bushaho families are found in Nkuringo to the south-west of Bwindi. Tracking the steep terrain of Nkuringo can be more challenging; however, it is served by excellent lodges and, in addition to views of Bwindi Impenetrable Forest, has views of the dramatic Virunga volcanoes. The Bushaho is a newly habituated family and tracking times can be long. Mgahinga Gorilla National Park is home to more than 80 mountain gorillas but has just one habituated gorilla group, the Nyakagezi family, with 10 members. Rwanda has 11 habituated gorilla families (10 of which can be visited): Agashya, Amahoro, Bwenge, Hirwa, Karisimbi, Kwitonda, Sabyinyo, Susa, Titus, Ugenda and Umubano. All 11 live in Volcanoes National Park. As in Uganda, the location of each family determines the length and difficulty of the hike required to reach them. The Karisimbi, Amahoro, Kwitonda and Ugenda families are more challenging to track, while Sabyinyo is the nearest and easiest group to reach. In a 1981 census, just 254 mountain gorillas were recorded in the wild. These were bleak days for the species, with untrammelled poaching for bushmeat and the exotic pet trade pushing mountain gorillas to the brink of extinction. Their plight was brought to the world’s attention thanks to the efforts of zoologists like Dian Fossey and broadcaster David Attenborough. Fossey dedicated her life to studying the mountain gorilla, spending decades living among the critically endangered apes in Rwanda and the DRC. In the days before properly organised and regulated gorilla tracking, Fossey was an outspoken critic of tourists visiting the animals, due to the gorillas’ lack of immunity to common human illnesses. Fossey’s pioneering studies helped dispel the belief, commonly held at the time, that gorillas were ferocious, dangerous beasts. Her efforts to publicise their plight eventually broke into the mainstream: the 1988 film Gorillas in the Mist, starring Sigourney Weaver, is a dramatised version of Fossey’s autobiography. Fossey was murdered in 1985, aged 53. Her death remains unexplained, with suggested motives ranging from petty grievance to opposition from vested interests in the poaching trade. But Fossey’s legacy has endured. In September 1967, she established the Karisoke Research Centre and became the spokesperson for an international effort to protect the species and their habitat. Today the Dian Fossey Gorilla Fund International continues her work in research, conservation and public education. 30 years on, although populations have gradually recovered, the species is still classified as critically endangered. Encroachment of land for farming, disease transmission from humans, poaching and illegal logging are daily dangers. Oil exploration threatens massive habitat loss. Political instability and conflict remains a serious risk for mountain gorillas in the DRC. The difference today is that the mountain gorilla has become a huge conservation priority in both Rwanda and Uganda -- in part thanks to the lucrative gorilla tourism industry. Conservation efforts include improved policing of protected areas, harsher penalties for poachers and wildlife traffickers, better veterinary care, community education, the development of alternatives to firewood for fuel, and investments in alternative means of livelihood. In Rwandan culture the naming ceremony for a newborn child is a community event and every September the country celebrates Kwita Izina, a national naming ceremony for newborn gorillas. Initially a one-day event, Kwita Izina is now a week-long affair that celebrates Rwanda’s progress in gorilla conservation while highlighting the challenges that the species continues to face. One of the key factors for effective conservation is an awareness of the people who also depend on the land for their own survival. Much of the gorilla habitat borders and overlaps with remote and poor communities. People lived in these areas long before national parks and protected areas were created, and hunters and farmers have always used the forest as an essential source of fuel and food. Now they find entrance to their historical lands is strictly controlled and regulated. To mitigate the human impact, a percentage of every gorilla permit fee (10% in Rwanda, 20% in Uganda) is invested in the surrounding communities to support infrastructure, schools and alternative livelihoods. Conservation organisations also provide schemes for fuel-efficient stoves and solar panels to reduce the use of charcoal and wood, and to encourage community farming as an alternative to hunting. Conservation isn’t always inclusive. In the 1990s the mountain gorilla seemed to face certain extinction and international pressure for action mounted. Bwindi and Mgahinga National Parks were established but with little consideration for the Batwa, an indigenous tribespeople who had lived in the forest alongside the mountain gorillas for millennia. Suddenly this tiny community of a few thousand found their entire way of life outlawed; they were branded as common poachers and evicted from their ancestral lands. The displaced Batwa were left landless and destitute, dependent on charity and government support for their survival. Support for the Batwa is now more readily available, but sadly the damage to this ancient forest tribe has already been done. The work to save mountain gorillas over recent decades has led to a dramatic turnaround in their fortunes, and is something that we are immensely proud of here in Rwanda. But while the gorilla population is stronger than ever before and the tourism industry brings a welcome source of revenue to the country, not everyone has benefited from our success. In order to make way for the new national parks, the Batwa people were evicted from the forest without compensation and have been excluded from the rapid progress made elsewhere. These communities were not consulted or involved in conservation programmes and we didn’t pay enough attention to the cultural and economic aspects of gorilla conservation. Not only was this an injustice, it was a huge missed opportunity. The Batwa have an ancient connection to the forest, and we can use their culture and heritage to drive a fair and sustainable approach to conservation. I began my career in conservation more than 13 years ago. One of the things I’ve learned is that conservation is not just for skilled academics, politicians and campaigners. Working in Volcanoes National Park, I noticed that for every highly qualified expert were several ‘unqualified’ assistants -- people without any formal education or training but who were essential to provide local knowledge and ensure success. I realised that everyone, regardless or education or background, is a born conservator. After many years working with the Dian Fossey Gorilla Fund (now known as The Gorilla Organisation) I helped establish Partners For Conservation. We’re a local, non-governmental organisation dedicated to protecting biodiversity through fair and inclusive conservation activities. Partners For Conservation believes in the innate ability of local people to be full partners in biodiversity protection, and that sustainable conservation is best achieved when local communities are represented in the decision-making process. We create opportunities for less privileged partners to actively participate in designing and implementing local conservation programmes, driving a sense of responsibility and ownership for people who were previously excluded. We support the creation of community based organisations to help strengthen the voice and representation of local people. We also provide education and capacity-building to help people represent their interests and communities. We aim to give everyone, from farmers to businessmen, an opportunity to enjoy and participate in the protection of our biodiversity. The challenges ahead are huge and cannot be achieved without active participation of all stakeholders. We will continue to work with Rwandan citizens, public institutions and civil society partners to build a brighter future for all who share our natural heritage. Visit www.notrebio.org to learn more about Partners For Conservation and see how you can support their work.